My name is Chris Day. 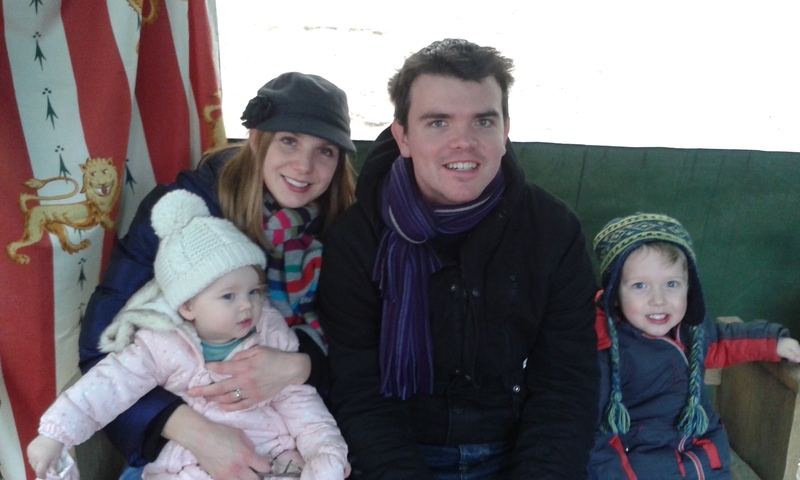 I am 32 and a doctor with a young family. I have been fighting for whistleblowing protection for myself and other junior doctors since August 2014. I have lost my career as a result of raising concerns about the adequacy of night time staffing of an Intensive Care Unit in South East London that routinely departed significantly from national standards of staffing. Our initial CrowdJustice appeal for whistleblowing protection for junior doctors raised over £42,000 from 1,499 people. The case has been covered by ITV News and we have been featured in multiple newspaper and journal articles. I am asking for help to enable me to continue this fight. My claim against Health Education England is currently waiting for the Court of Appeal to determine my application for permission to appeal. Unless my appeal succeeds, or there is a change to the law, the careers of junior doctors will not be protected by whistleblowing law. I am asking for financial support to be able to pay my lawyers to continue my case in the Court of Appeal and subsequently in the Employment Tribunal and to go on advising me in my campaign to secure full whistleblowing protection for junior doctors. We are attempting to raise £100k to enable us to litigate this important point in the second highest court in the country. I am tremendously grateful to all those who have supported me thus far. Please donate what you can so that my case and this campaign can continue until junior doctors have the same whistleblowing protection as other employees. Do you want your doctor to be able to speak openly about patient safety and resourcing without being afraid it will damage their career? Can you really expect a doctor to do this if they do not have the same legal protection as other employees? The Francis Freedom to Speak Up review found that 13.5% of NHS staff that raise concerns about safety are victimised. You would have thought that junior doctors should be thoroughly protected against this happening to them. Patients up and down the country rely on their professional expertise and rely on them to speak up if they have concerns about safety or resourcing. They don’t expect doctors to be at risk if they do. My case, and my campaign, drew attention to the fact that junior doctors are not properly protected when it comes to whistleblowing law. Initially the authorities refused to accept that this is the case, but as a result of my campaign they have changed their position and have accepted that junior doctors need full statutory whistleblowing protection. Unfortunately, what they now propose does not go nearly far enough. More information on the new proposals is here. Despite this, I have waited over 2 years to have my whistleblowing case heard. Because of a problem with whistleblowing law it may never be heard in full by an Employment Tribunal and the facts of the case may never be properly scrutinised. My case has significant implications on a junior doctor’s ability to speak openly about safety or resourcing in the NHS, as I explained on ITV News. The case was even discussed in Parliament March 24 2016. The law in this area is complex, but essentially there are two problems. The first is that Health Education England (HEE), the NHS body with ultimate power over junior doctors’ careers, still claims to be exempt from whistleblowing law. The second problem is that the short term contracts HEE arranges for junior doctors mean that their careers are not protected if they whistleblow. A junior doctor loses the right to have an Employment Tribunal order the NHS to give them their jobs back as the NHS organisation with actual power over employment claims to be exempt from employment law. As a direct result of my litigation, a potential lacuna or gap in whistleblowing law has been identified. This was a problem that had previously been denied by the BMA, Government and NHS but can no longer be denied, a direct result of our campaign and litigation. The EAT Judge Mr Recorder Luba QC stated in his Judgment dated 26 August 2016. After initially denying that there was a problem, the Government and the other authorities agree that the current law is inadequate but none of them are willing to put junior doctors on the same footing as other employees and give them full statutory protection. Unfortunately, what they now propose does not go far enough and continues to deprive junior doctors of the right to have their career protected by whistle-blowing law and their case heard in full in an Employment Tribunal. Their long-term career and employment continues not to be recognised by employment law. It has been left to me to campaign for this on my own. That is why I am asking for your help again. I am extremely grateful to my legal team, James Laddie QC and Chris Milsom, barristers, and Tim Johnson/Law, solicitors. We are also very grateful for the advice and support we receive from the charity Public Concern at Work. The legal advice and analysis which has enabled me to expose the legal problems with whistleblowing for junior doctors. Further legal advice to help me establish full whistleblowing protection for junior doctors. The case was featured in the Mail on Sunday. The Health Secretary’s actions and chronology of the events comes out particularly strongly. We are grateful to Jo Macfarlane for covering the case. Tim Johnson our fantastic solicitor spoke to the Law Gazette as their ‘Lawyer in the News’, following our victory in the Court of Appeal on junior doctor whistleblowing protection. Tim rescued the case in October 2014 when the BMA decided to withdraw their lawyers days before a legal deadline. Our Crowd Justice supporter made this case impossible to ignore. Below is a summary of the coverage of the appeal decision in the press and in specialist journals. We delighted to announce that the Court of Appeal has upheld our appeal on junior doctor whistleblowing protection. Many thanks to all our supporters and to our legal team. This includes the generous intervention from Public Concern at Work. We had our big day in court yesterday. We were in the Court of Appeal arguing not just for whistleblowing protection for 54,000 doctors but now it seems also for huge numbers of agency workers and those in tripartite employment relationships across many industries. James Laddie QC did a fantastic and eloquent job opposing the position of Health Education England on behalf of me and 54,000 junior doctors. HEE’s position was that if a doctor is employed by an NHS Trust it is not possible for the doctor to have another employment relationship with a separate NHS entity with power over their career under the extended definition of employer in Section 43K of the Employment Rights Act. HEE also argued that the Employment Tribunal was right to determine that HEE had no substantial influence over the engagement of me and other junior doctors and could not be caught by ERA s43k. Thomas Linden QC on behalf Public Concern at Work made powerful submissions on the potential consequences the EAT judgment in my case might have on other agency and tripartite workers. The judgment was reserved and should be handed down in 4-8 weeks. We are overwhelmed by the level of support we have had. We could not have done this without the support of our backers and our excellent legal team. The intervention of PCAW was the subject of a HSJ article. I am delighted to inform you that our Court of Appeal hearing has been fixed for Tuseday 21 March 2017 at 10am. It will take place at the Royal Courts of Justice, London. Public Concern at Work apply to intervene as a third party in our appeal. Public Concern at Work have applied to intervene as a third party in our appeal. Public Concern at Work&apos;s intervention in our appeal is stated to be “made on public policy grounds given the importance of the outcome of the appeal in clarifying the scope of section 43K of the Employment Rights Act.” Included in their helpful submissions and evidence are examples of how the EAT Judgment in my case can affect the whistleblowing protection available to workers in other industries. In addition to my legal team, James Laddie QC, Chris Milsom and Tim Johnson Law, PCAW have instructed law firm Claire Murray LLP and Thomas Linden QC to represent them as an intervening third party in our Court of Appeal litigation against HEE. PCAW was established as a charity and legal advice centre in 1993 and deals exclusively with issues related to whistleblowing in the workplace. They are involved in matters related to whistleblowing at all levels, including government policy and legislation. From time to time they have been involved in cases which they believe to be of particular relevance to their work. They were closely involved in setting the scope and detail of the Public Interest Disclosure Act 1998 (PIDA), which provides a framework for the promotion and protection of public interest whistleblowing. They monitor the operation of the Act in the workplace and in the legal system and they promote its approach to corporate and public governance across the UK and abroad. The appeal is due to be heard on 21/22 March 2017 in the Court of Appeal (Royal Courts of Justice, Strand, London). More details are here. To find out more about Public Concern at Work please visit their website and to read their blog about our case click here . I was pleased to have contributed to BBC Radio 4&apos;s File on Four documentary on NHS whistleblowing. As we prepare for our Court of Appeal Hearing on 21/22 March, this documentary serves as sobering reminder of the wider context of our litigation. To listen to the documentary click here . Whistle-blowers said they&apos;d been left financially ruined, blacklisted and sent to the brink of suicide after being branded snitches and trouble-makers. Doctors who have spoken up since say they&apos;ve faced the same catalogue of bullying and abuse by their employers, and in some cases, the focus remains on protecting reputations of Trusts, rather than addressing poor care. So is the culture changing quickly enough? We have had fantastic news about the case. 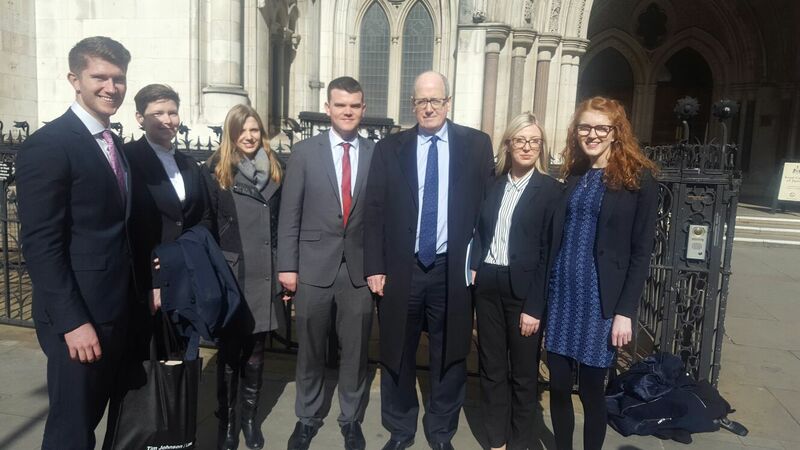 Our 10 month wait to have our appeal heard by the Court of Appeal has been reduced to 2 months by a Lord Justice. Our application for expedition has been successful and the case has now been allocated a date by the Court of Appeal. The appeal has been listed to be heard on either 21 or 22 March 2017 in the Royal Courts of Justice, Stand, London WC2. To view more details about the hearing, our application for expedition and the BMA reaction to the appeal please click here. We have been given some disappointing news. The appeal date for our appeal to clarify whether 54,000 junior doctors are protected by whistleblowing law is not until 27 November 2017. The events surrounding the whistleblowing in my own case occurred in 2014 and have still not been heard by any court or tribunal and will never be heard in full unless our appeal succeeds. We have applied for an expedited hearing. Junior doctors have been without statutory whistleblowing protection for their careers since February 2015. It is vital for patient safety that this appeal is heard as a matter of urgency. Below is a summary of our Grounds for Expedition. The reason for this appeal is that HEE denies that it falls within the extended definition of an employer found in s43K of the Employment Rights Act. This has caused an apparent lacuna in whistleblowing protection for 54,000 doctors and their patients. It is urgent that this lacuna is clarified. The Francis Inquiry into Mid Staffordshire has clearly identified the importance of whistleblowing in respect to junior doctors and other NHS staff. Patient safety and mortality are left at risk the longer the progress of this appeal remains uncertain. Whilst simultaneously arguing junior doctors out of statutory whistleblowing protection in 2015, Health Education England recently has proposed a third party contractual solution to the lacuna identified that is said to give equivalent rights to statutory whistleblowing protection. However, James Laddie QC has described this protection as ‘illusory’, his opinion can be found here. As noted by Lord Justice Elias. The EAT decisions in my case and Mctigue are at odds with each other. In the interests of justice and avoiding further divergent decisions for agency workers, urgent clarification is required. 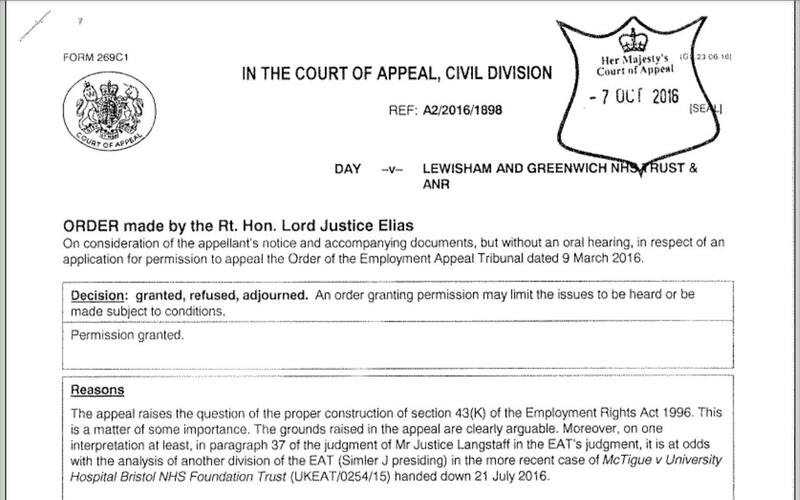 Lord Justice Elias also noted the appeal raises a matter of some importance. His order can be found here. The urgency of the appeal is palpable from the manner in which the appeal has been funded. At the time of application for expedition, some 2500 people, had contributed over £80,000 to fund the appeal on Crowd Justice, the number of supporters is still growing. It has become well known that my case has identified a potential gap in whistleblowing law affecting all junior doctors. James Laddie QC has provided an opinion on the claim by the Department of Health and the BMA that the new junior doctor contract has closed the gap in whistleblowing law identified by my case. The full James Laddie QC opinion can be found here . Below is a quote from the opinion. Is this really how we want our doctors and patients to be protected? "Of course, it may well be said that some protection is better than no protection. That is not to be sniffed at, but if the reality of the position is that the protection conferred by the Agreement is uncertain in scope, potentially ruinous in terms of costs and suffers from the other difficulties identified above, then most potential complainants will not avail themselves of it. The protection is, for the most part, illusory." Our Press Release on the above opinion can be found here . Momentum is growing for our Crowd Justice campaign to win back whistleblowing protection for all junior doctors. We are so grateful that we now have over 1100 backers. On receiving leave from the Court of Appeal I made the following video to explain the significance of the situation. Medical negligence lawyer Peter Stefanovic and doctor Dr Kishan Reeves produced this video in support of our Court of Appeal litigation following us being granted leave to appeal. Yesterday the Junior Doctor Blog’s Dr Dominic Pimenta wrote this excellent piece on the appeal. He describes the legal lacuna at the centre of our appeal as “a legal loophole so dangerous it could swallow up the entire NHS.” Please click below to read his blog. Please continue to follow events in this incredible fight. I am so grateful for your support. 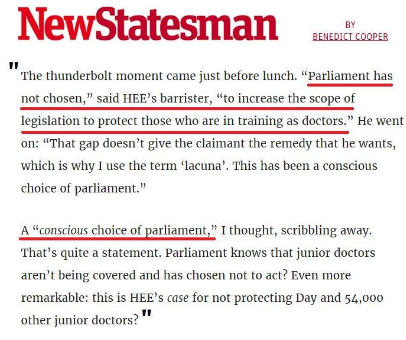 On the question of whether HEE is an ERA s43k employment agency of junior doctors and whether a junior doctor&apos;s career is protected by whistleblowing law? We have been granted leave by the Court of Appeal to appeal a decision of the Employment Appeal Tribunal that pushed the careers of 54,000 doctors outside of statutory whistleblowing protection. Our application for leave as been met with considerable resistance from the NHS and has not been supported by the BMA.